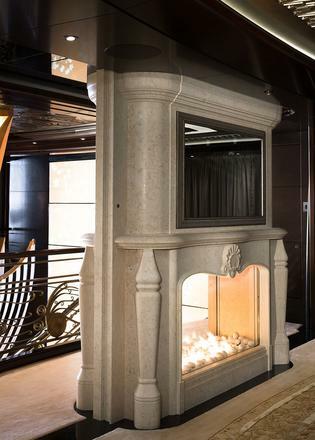 Fireplaces on yachts are a great technical challenge, but when they are properly designed they can provide a stunning centrepiece for the saloon, instantly warming the atmosphere on board. 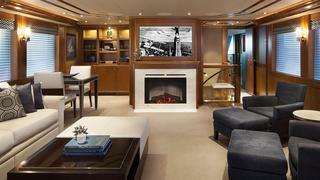 We round up the very best yachts with fireplaces, starting with Haida 1929. Owner Jan Verkerk was instrumental to this explorer yacht's rebirth at Icon Yachts and his antarctic cruising plans necessitated plenty of cosy spaces to warm up. The elaborate main deck fireplace is the most notable example, with ornate fish sculptures and dark woodwork contrasting with the plush white armchairs, but there are also several steam-powered Opti-myst fires on board this remarkable and rugged globetrotter. The spacious skylounge on board 40.52 metre Serenity was designed to be a true man cave complete with a fully stocked bar and humidor. However, it is the superyacht fireplace that steals the show, as its shimmering electric glow catches the eye from all angles. Launched in 2016 by IAG Yachts, Serenity was styled inside and out by Evan K Marshall. Ramp up the romance and snuggle up next to this 19th century English fireplace in the forward dining saloon of 100 metre superyacht Attessa IV. Originally built in 1999 by Hayashikane, Attessa IV was masterfully rebuilt by her loving owner Dennis Washington, for whom redoing yachts is his passion, pleasure and relaxation. The puzzle he worked on was how to keep such a large vessel intimate, both inside and out. To control the vastness of the space, he envisioned Attessa IV as having a waist at the area of the central ventilation and exhaust trunks amidships, and flares to widen the side decks fore and aft. Ramp up the romance and snuggle up next to this 19th century English fireplace in the forward dining saloon of 100 metre superyacht Attessa IV. Originally built in 1999 by Hayashikane, Attessa IV was masterfully rebuilt by her loving owner Dennis Washington, for whom redoing yachts is his passion, pleasure and relaxation. The puzzle he worked on was how to keep such a large vessel intimate, both inside and out. To control the vastness of the space, he envisioned Attessa IV as having a waist at the area of the central ventilation and exhaust trunks amidships, and flares to widen the side decks fore and aft. At the forward end of the dining room on Serene is a magnificent glass-enclosed gas fire pit. Currently in 14th place on our definitive list of the top 200 largest yachts in the world, this 133.9 metre Fincantieri has seven decks, a hangar and two helicopter landing pads. Below decks a large salt water swimming pool can accommodate service craft and a submarine with a diving depth of up to 100 metres. 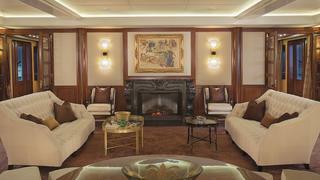 She also boasts 4,500 square metres of interior space designed by Reymond Langton Design. Reymond Langton made sure Elysian (ex-Ester III) resembled an intimate home — including the snug fireplace in the main saloon. Designed by Espen Øino, this 65.8 metre Lürssen is one of the smaller Lürssens launched in recent years but is high-tech and highly original, having been built strictly for family use. Sit back and ignite the feeling of relaxation in the large seating area forward of the dining table on Solandge. This superyacht was launched in 2013 and can accommodate 12 guests in eight cabins, including a dedicated owner's deck. The contemporary interior of this 85 metre Lürssen, designed by Aileen Rodriguez, has classical touches and a mix of rare materials including 49 stone selections and 33 exotic woods. Solandge is also notable for having two standout cinemas on board. Sit back and ignite the feeling of relaxation in the large seating area forward of the dining table on Solandge. 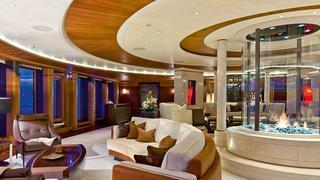 This superyacht was launched in 2013 and can accommodate 12 guests in eight cabins, including a dedicated owner's deck. The contemporary interior of this 85 metre Lürssen, designed by Aileen Rodriguez, has classical touches and a mix of rare materials including 49 stone selections and 33 exotic woods. Solandge is also notable for having two standout cinemas on board. 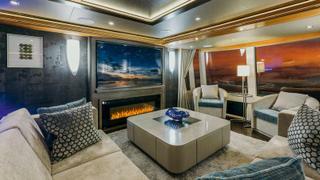 You’ll warm to any one of the four fireplaces on board Kismet. The on board fireplace pictured above burns bright in the atrium. Launched in July 2014, this 95 metre Lürssen took a major honour at the 2015 World Superyacht Awards, claiming top spot in the Displacement Motor Yachts of 1,300GT to 2,999 GT of 75 metres and above category. Having already built the first Kismet, now named Global, owner Shahid Kahn knew what was required when he decided to build a new bigger, better yacht: a winning combination. 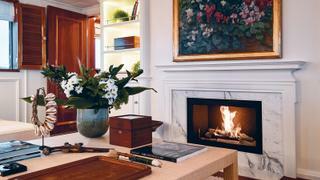 You’ll warm to any one of the four fireplaces on board Kismet. The on board fireplace pictured above burns bright in the atrium. Launched in July 2014, this 95 metre Lürssen took a major honour at the 2015 World Superyacht Awards, claiming top spot in the Displacement Motor Yachts of 1,300GT to 2,999 GT of 75 metres and above category. Having already built the first Kismet, now named Global, owner Shahid Kahn knew what was required when he decided to build a new bigger, better yacht: a winning combination. Panoramic views aren’t the only sizzling feature in the upper saloon of this Westport 130; the lovely fireplace will spark interest, too. Built from GRP and with a top speed of 24 knots, this superyacht was designed by William Garden. 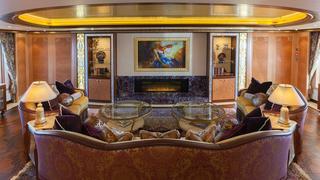 She has accommodation for up to ten guests split across five staterooms, with additional space for seven crewmembers.